Ends pass at four beats per second, twice the speed of dance music and precisely the speed of the pumping soundtrack that drives End of Ends into the majestic absence of x-church. Profound, trite, personal, generic, the listed ends are barely readable as they flashlap by. Dutton, Webb and all the people who contribute to the list make this piece but Pulse rules it. End over end over end over end. Negative stuff? No, because in the same way that loud points at silent, end points at start. Sound knows this and pulls hardest on Pulse’s rope. I left with an image of Sound dancing on List’s grave. 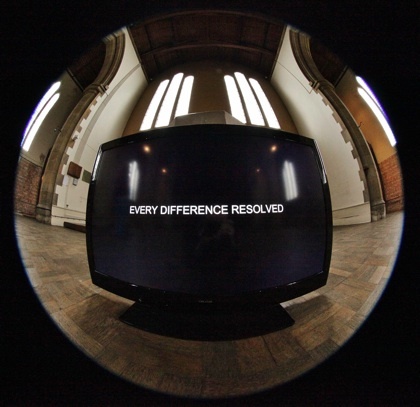 The artwork is an installation consisting in part of two monitors displaying a long series of pithy phrases stating, or evoking, different human ‘ends’ on a loop basis. The other material aspect of the installation is several speakers projecting a soundtrack reminiscent of contemporary ‘dance’ music. 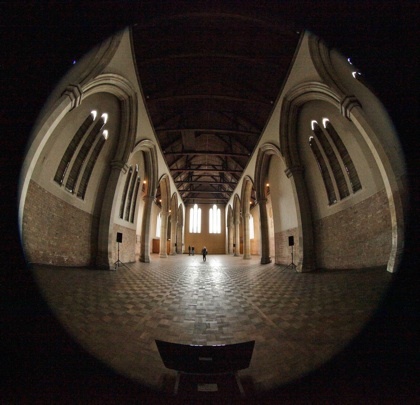 X-church provides a vast space, yet the installation is not overawed; rather it commands visitors’ attention. It becomes apparent to the viewer that each line of text flashes by on the very cusp of human capacity to consistently register each phrase. Actually at 0.25 of a second, or twice the standard beat of a certain genre of modern ‘dance’ music. As the viewer struggles with this near assault on the neuro-visual-auditory senses you may wish to focus on a phrase which you find particularly arresting, but there is no time now for reflection. The insistent driving beat, accompanying the rush of imperative ongoing phrases, is like a magnetic force drawing you into deeper engagement with the work yet driving you forward. For me the phrases became momentarily fragments of an almost surreal kinaesthetic narrative which I savoured, before later reflection on the most personally memorable phrases. How do the phrases strike the viewer? My responses were, inter-alia, profound, humorous, thought-provoking, bizarre, potentially deeply-personal, challenging, but what will be your subjective response? I can imagine that some will find the installation unsettling, or even fear-provoking, but ‘ends’ need not evoke pessimism. We can aim at joyful culminations or ‘ends’ which lead to satisfying new beginnings. The work is accessible, yet challenging and participatory, like much of contemporary art. After two enthusiastic visits the work left me feeling enlivened and optimistic about human ‘ends’. I could hear a church with hot pink doors purring as I walked towards it through the ‘wrong side of town’ in Gainsborough, East Midlands. So it was these pulsating vibrations that introduced me to the latest exhibition, End of Ends, at x-church – a deconsecrated church built in 1882 and transformed into a dedicated exhibition space in 2006.
x-church folds into the surrounding suburban streets of Gainsborough, a town whose ‘regeneration’ catch cry has weakened under recent economic hardships. The town is sleepy and dusty. A passer by, straining in the hot sun with too many shopping bags, glances up at the church. He too has heard the pulsating vibrations. He reads the exhibition title then walks on. For Marcus Hammond, owner of x-church, you get the feeling that even such a small acknowledgement is enough – the ability to pierce a man’s day with something to think about as he walks home through one of the county’s most underprivileged areas. Achieving this seems to satisfy Marcus’s passion for making art accessible. Before visiting End of Ends – An Arts Council funded project exploring the idea of endings by University of Lincoln artist/academic Professor Steve Dutton in collaboration with artist Neil Webb and supported by artist Kate Buckley – I had viewed its online existence at www.endofends.co.uk. 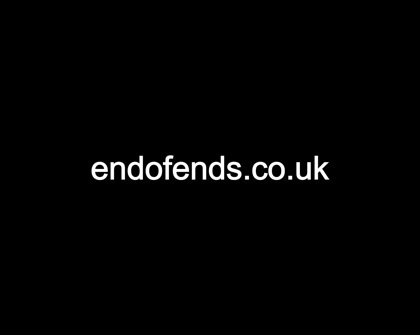 The site encourages visitors to submit up to six words describing something that ends. The result is a potentially never-ending list of endings, submitted by anonymous people from around the world that flash past on the screen faster than your eyes can focus on any one sentence. In this form, the work is unsettling. Your eyes and brain battle for comprehension as words like love, clock, nothing, privacy, and tears jump out from their carefully formed sentences for recognition. If you stay on the page for more than a minute or two however, your desire for a sensory reaction or comprehension is cracked and you’re able to let the words and incessant clicking wash over you until you become aware that you’re watching something universal and bigger than your own existence. Something forever changing, forever moving and forever growing. End of Ends in its non-digital form however, gave me something else. Text, sound, shadows and space wrapped me in a feeling instead of a thought. 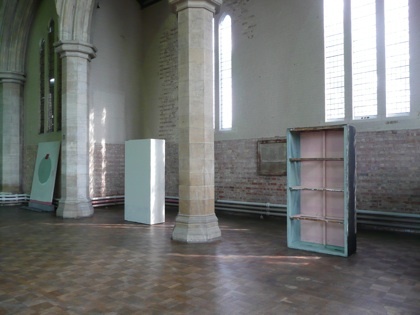 The space had been stripped bare for the work, and this absence not only focused my attention on the two flat screens flashing descriptions of ends at the front and back of the church, but also made the screens look both reverend and humbled as they sat on the floor between huge stone pillars. Their delicate presence drew me in like they had a secret. I stood between them and slowly turned my head from one screen to the other, tuning in and out of the incessant list of ends as my brain got used to the idea of not comprehending what they said, but simply feeling. A switch helped by the hypnotic, meditative soundtrack bouncing from the huge stone pillars and the beauty of shadows dispersing across the bare church floor. I began to feel the words flashing on the screen. I felt them attach to memories and float by like driftwood…love, clock, nothing, privacy, and tear… I felt them detach from meaning until the flashing words were not part of someone else’s comprehension of an end, but part of a feeling I owned. An odd feeling of calm, and a sense of belonging. Not belonging to a time, memory or place, but a sense of belonging to the collective consciousness of humanity. BITR Project artist Charles Monkhouse works with light. 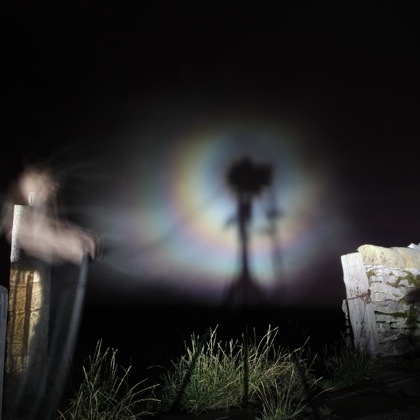 Brocken spectres are optical phenomena, a combination of projected shadow and an iridescent glory. As the origin of the halo, they are employed in the iconography of many mythologies and religions to denote holy or sacred figures. Scientifically, there are three components: the sun, cloud or mist, and a viewer. 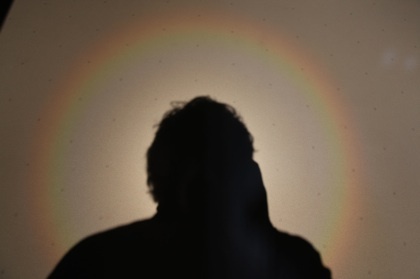 The shadow of the view is projected on to the cloud and an iridescent glory is created around the shadow of the viewer’s head. 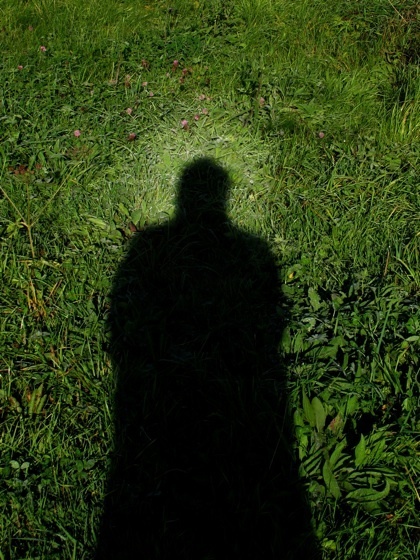 For a group, the shadow will include all viewers, but there is only ever one glory, always around the head of the viewer’s shadow. 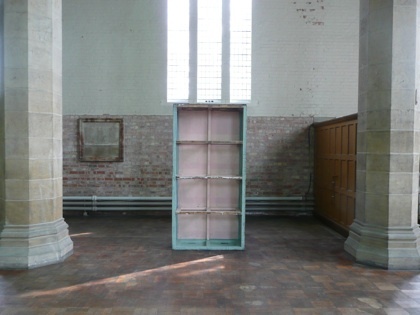 Camden-born young artist Frank Kent arrived at painting via graffing and carpentry. His time in art school culminated in 4 large paintings made in and for a specific time and place – his degree show at Nottingham Trent University in 2010. BendInTheRiver selected him for a BITR Project to challenge him to develop his thinking around site-specific painting away from the supportive framing of a college environment. 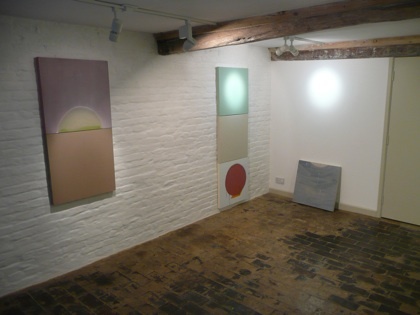 He has chosen to use our two sites to rework the degree show paintings and some newer studio paintings. His best fixes subtly smash style against place. These new paintings are very much his work but after the show, away from these particular contexts, the supporting lights and blocks, they will be incomplete….at least until they meet their next location. Most exhibitions are culminations. Visual Delusions is more like a moment. Frank thinks and paints with a light touch and is increasingly absorbed by the theatre of painting. Work in progress is as much about documenting chance moments generated by the activity as it is about the paintings themselves. His laptop is alive with images of chancy marks…light patterns, drips, smears, residues. It is not surprising that an artist rooted in the drama of graffiti (finding, spraying, running) should need such an active approach to making paintings but it is perhaps surprising that the images he makes so deftly reference the language of abstract painting.